Let’s get the big, obvious one out the way first; what took them so long to come back out here to the Über Kingdom of Rock ‘n’ Roll?! How do things differ in the States to out here? How does it differ as well in terms of how people perceive you – particularly when it comes to having such a huge thing as radio rock out in America, where over in the UK there’s so little radio airplay for rock bands? You guys dropped ‘All I See Is War’ back in May – how did you find the reception to that? They reckon you’d written 50 or 60 songs for the sessions, did that make it more difficult than usual to editorialise and pick which ones would make the final cut? We live in an economy now where unused songs and B-sides are much more available thanks to streaming platforms and digital downloads – do you think you’ll use any of the offshoots? Some of the press materials for the record basically describe it as a rebirth for the band – why do you think that was so important this time out? Why do you think it is important bands stay connected to where they started? Do you find that when you go home you can easily shed off the ‘rock vocalist’ persona? What made you decide to suit up again then, and hit the studio? What was the mindset in recording the new album? 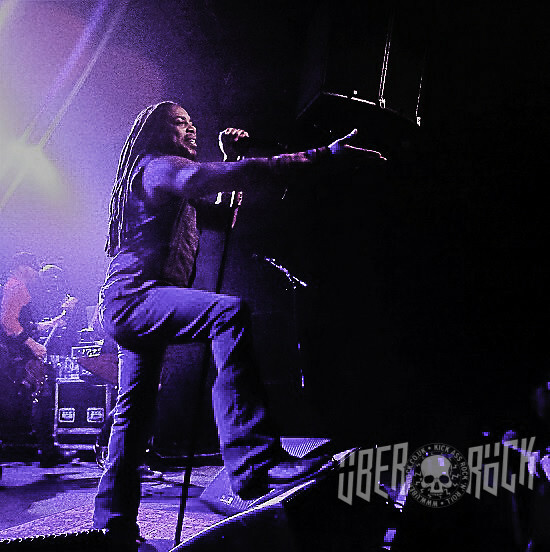 What does it mean to be Sevendust in 2018? Next year will mark your 25th anniversary as a band – do you have anything special planned for it? What is the biggest difference between when you first started and now? 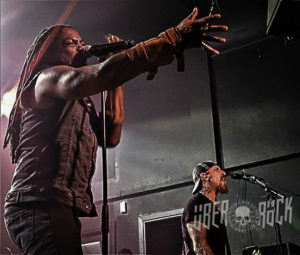 What has been the biggest challenge Sevendust have faced so far? You guys have existed alongside some of the biggest scene explosions that metal has had – the nu metal and metalcore booms of the 00s being a prime example. How do you think you guys managed to deftly navigate being able to take advantage of the increased interest, but also maintain your own style that said you weren’t just part of a single scene? What has been the craziest, most stand-out moment of your career thus far? Do you think that represents a slight renewal of interest from “The Industry” in bands within the rock and metal sphere? ‘All I See Is War’ is out now via Rise Records. Photographs by the author. Taken at Nottingham’s The Rescue Rooms.